sailboat. 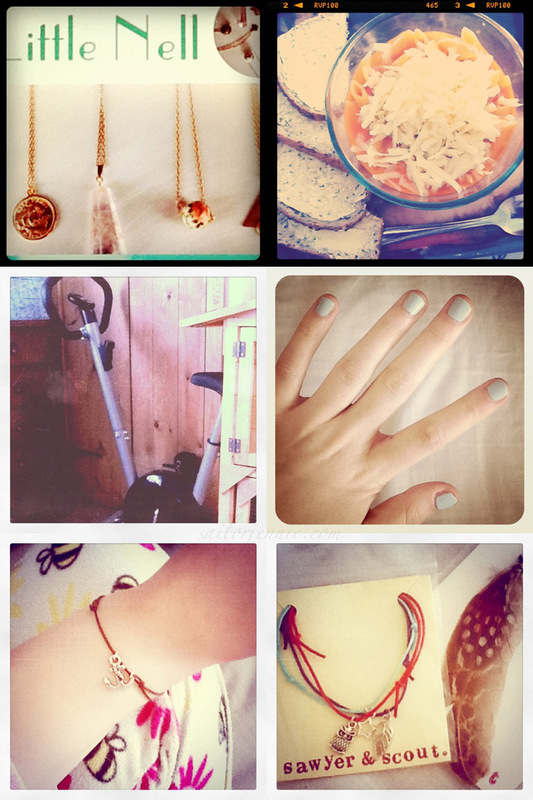 : Sunday Snapshots: Instagram Style 004. One. My Little Nell jewellery giveaway ends tomorrow (Monday) at midnight so if you'd like to enter you still have time! You have the chance to win £15 to spend in the online store & there are some completely gorgeous pieces to choose from! My favourite is the little gold coin necklace, what's your favourite piece? Two. You really can't beat comfort food every so often. It was super rainy and cold the other day so I got all cosy under a blanket and had some super yummy soup with pasta in it & lots of cheese! It was pretty amazing, I'm not gonna lie! Three. I'm on a mission to loose a few pounds (total contradiction to nomming away on not so healthy food!) but I have a big problem - I'm allergic to 99% of exercises. Okay okay, I'm just a bit lazy. But I decided to invest in a cheap exercise bike & I've strangely been really enjoying using it! Maybe it's because you get to sit down, it almost doesn't feel like exercise at all. That is of course until your legs cramp. Yeah. That's not so fun. Four. Essie Borrowed & Blue nail polish is officially my favourite of all time. The colour is just beautiful & I'm fairly sure that everyone should own a bottle of this! Five. Yesterday in the post I received this super cute little anchor bracelet from an online jewellery store called Sawyer & Scout and I adore it! It's such a simple piece but I think it's wonderful & of course, I'm a sucker for anything nautical! Six. Two of you lucky lovelies will be able to win a piece from Sawyer & Scout really soon! I've got a beautiful feather necklace and a set of bracelets to giveaway so keep a look out for that! In the mean time I'd love for you to pop over to the Sawyer & Scout big cartel store and have a peek at the jewellery if you'd like to & also go and say hi to Elise, the lovely lady behind the jewellery shop, because she has a lovely blog! What have you been up to this week? Have you had a good weekend? Mmm, I really need pasta now! Good on you for doing all the exercise. I do a lot of walking but I hate making myself do other types of exercise. I should probably address that situation! Lovely photos and cute bracelet. Great post - The Essie nail polish is fab! that pasta soup looks lush! and my sister got an exercise bike, but as she doesn't use it I've kinda inherited it haha. that nail polish is gorgeous! hope you're having a nice sunday! Aw that bracelet is cute, and is that a mini mac n cheese there??? Ommmmm looks delish! thanks so much for the links jennie, so lovely of you!